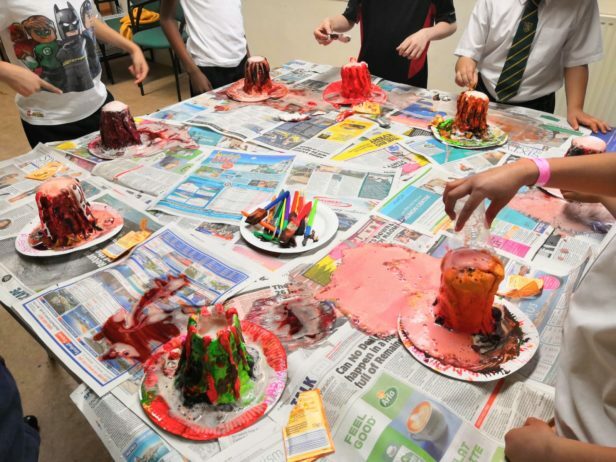 Children in our Inner London MySpace Group made a bang this week with their home-made volcanoes. 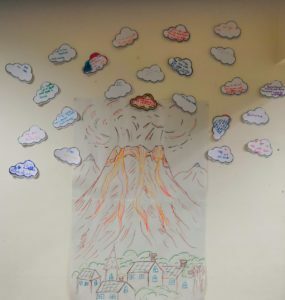 The volcanoes were created and decorated as part of an exercise designed to help the MySpace participants understand and express their anger and negative emotions. The bicarbonate of soda, vinegar and red food dye “lava” represented how negative emotions can erupt when left to bubble. As well as their own individual volcanoes, the group worked together to create these ash clouds, each containing a suggestion for a healthier, more helpful way to express and deal with anger. Suggestions included exercise, read a book, sing, and walk away. For more information on our MySpace groups, click here. To read more about the other services we offer, click here.